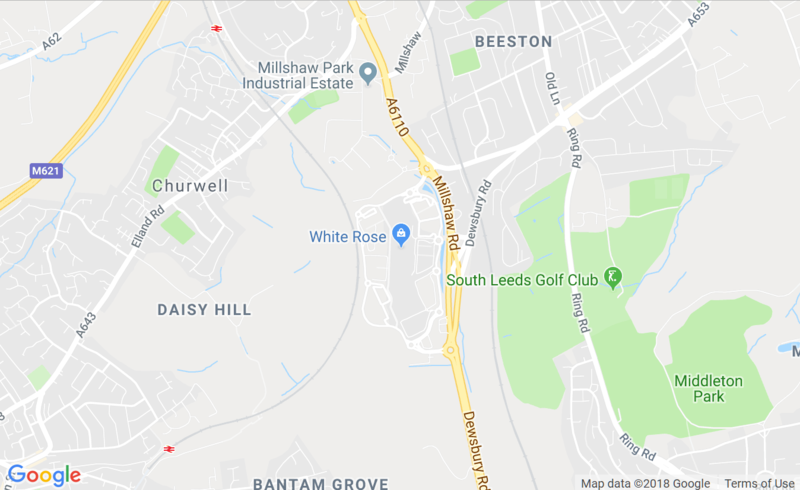 White Rose is conveniently located on the main A653 Ring Road, with easy access from the M621 (Junction 1) and the M62 (Junction 28). Sat Nav users should use LS11 8LU, Dewsbury Road, Leeds and follow the road signage off the motorways and main roads. We’ve got 4,800 free car parking spaces spread across 8 customer car parks, so you can even park near your favourite store! There are dedicated spaces for Blue Badge holders, you’ll find spaces for parents with kids in Car Parks 1 & 2 and secure motorcycle parking is also available. Plus, we now have 4 electrical car charge points in Car Park 5. Plan your driving route here. West Yorkshire Car Share links hundreds of sensibly-minded sharers across our region. Click on this link to see who you could enjoy the trip with: wycarshare.com. We’ve got our own on-site bus station and we are well served by buses from Leeds city centre and surrounding towns. For details of services hop onto: wymetro.com. You’ll find cycle parks at each of the entrances to the centre, and you can even use our shower facility during centre hours if you like – just ask at our Customer Service Centre. We’re within easy walking distance of local residential communities on the south side of Leeds. Just don’t be tempted to buy more than you can carry back! Here's a good site to help you find your way to White Rose and back: walkit.com.